Nelson Mandela’s autobiography A Long Walk to Freedom has just been transposed to what seems to be an epic movie. Epic is indeed a proper adjective for Mandela’s life, who spent a good portion of his adult life fighting the South African apartheid regime. In Mandela’s eyes, the only sane option was to resist a system which built walls of injustice between black and white people in the country. He organized an opposition party, wooed mass support, coordinated guerrilla efforts when diplomatic ones were met with indifference, worked during the night to lay low during the day, until he was captured by government forces in 1964. 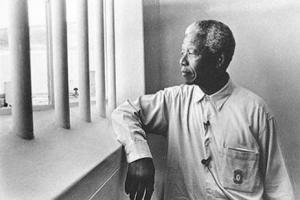 Deemed a threat to the country, he and his companions at the ANC received a life sentence in jail. He found out, in other words, that life has ample space for the heroic as well as the mundane. Life is decided in boring moments as well as in epic ones. Sometimes the best one can do is to carry out the tasks of the day, have a telephone conversation, fill out a spreadsheet, file a report. Sometimes we watch an inspiring movie and have just menial tasks to fulfill when we come home. Yet these moments are important, just as grand moments. Because the verve with which we face habitual duties will be the verve with which we will live the rest of our life. If we crumble before an uneventful day, so will we when it is time to take a life-altering stand, look someone in the eye or be ready to die for something. Nelson Mandela, quoted in Martin Meredith, The State of Africa: A History of Fifty Years of Independence (London: The Free Press, 2005), 127.